How Much Should Baby Expenses Really Cost? - I Am Proud Of My Kids! How Much Should Baby Expenses Really Cost? You just found out you’re pregnant. Your heart is racing with excitement and fear simultaneously. You know life is about to change, but you have no idea the extent to which it will. Just as the dust settles and your pregnancy fog clears, you start to mentally plan for your little one to arrive. What furniture should I buy for the nursery? Which car seat is the safest option? Do we really need that jogging stroller? What childcare options are there? How am I going to pay for college?!? Ha! There are so many decisions you have to make and it’s very likely you’ll have some serious sticker shock when you start planning for it all. Who knew that a little bundle of joy could cost so much? While providing for babies can be expensive, it doesn’t have to be unaffordable. A little research and work on your part could save you hundreds of dollars on your child’s expenses. Our guide will show you where it’s important to spend extra money and which items you can afford to buy secondhand or skip altogether. Car seat A car seat is an absolute must. You aren’t even allowed to leave the hospital without it! This is an item that you should definitely purchase new. You want to ensure that the car seat you’re using will fit in your vehicle and that it complies with current child safety laws. Well-rated car seat options range from $95-350. Consider your budget and make this a top priority. Nursery furniture The only real necessity for a basic nursery setup is a crib and mattress. A changing table is nice, but not necessary. If you have a dresser, you can convert it into a changing table by simply adding an attachable changing pad for around $30. Other items to consider might be a rocker or glider. For these and all other large furniture pieces, you could spend around $150 per item on the low end or up to $3,000 for a brand new crib. Breastfeeding costs If you’re planning on breastfeeding, you’re going to save money in comparison to buying formula. However, you may need to purchase nursing bras ($25-50 each), bottles ($5+ each) and a breast pump if your insurance doesn’t cover that cost. Depending on your pumping needs, you could get a manual pump for around $30 or an electric double pump for up to $250. Some hospitals will provide a pump for you, so do some research on this one! Formula/baby food Baby’s got to eat! If breastfeeding isn’t an option for you, this is obviously a necessary investment. Formula for one year can cost between $1,500 and $2,000. Look into supplemental programs and savings that are offered by different formula companies. You might have to try several brands before you find a good fit for your baby. Diapers This expense is a must, but there are options for you to explore here as well. Research shows that a baby will need an average of 2,600 diapers in the first year. At the price of .20 per diaper, you’re looking at a cost around $520 per year. You could also consider using a cloth diapering service, but the annual cost is going to be similar to using disposables. If you’re willing to purchase and wash your own, this is a great place to save. Even with the extra cost of water, electric bill and detergent, you can save more money in the long run, especially if you use your cloth diapers for successive children. Clothing It’s tempting to get lots of super cute outfits for your little one, but this is an area where you can save big. Because babies grow so quickly in their first year, they may have outfits they only wear a few times. Shop consignment stores for like-new clothes that have been rarely worn. You can score lots of great clothes for your little one at a fraction of the cost this way. Don’t forget that people will probably buy clothes for your baby shower and also give you hand-me-downs if you’re open to the idea. Stroller Strollers are certainly convenient, but aren’t an actual necessity. Depending on your priorities and lifestyle you may not even want or need one. You can purchase a traditional stroller for $50-250. Be aware that all terrain strollers and high-end strollers can cost $700 or more. Buying secondhand is a great option for this expense. Monitor A good baby monitor might be a priority for you, especially if baby’s room is far away from yours. There are simple wireless models that cost as little as $30. Video monitors can exceed $200. Think about your personal preferences on this one. Inexpensive monitors can be just as effective as fancy ones. 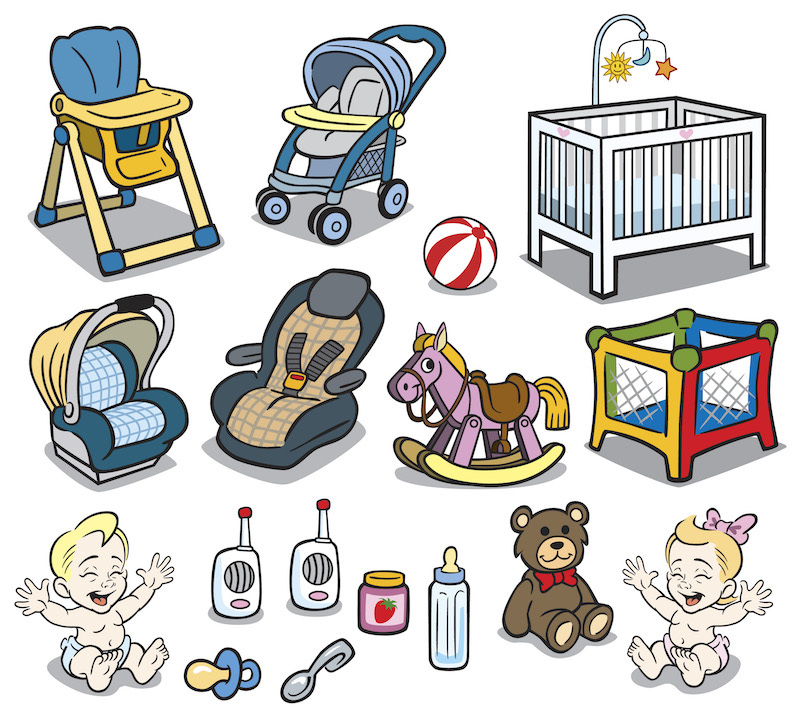 Baby gear/toys You know what we’re talking about: swings, bouncy seats, diaper pails, books and toys galore! You’ll be amazed at all the options out there. Borrow bouncy seats or swings from a friend and see how baby likes them before making an investment. Look for deals online and in store at the end of seasons. Ask for these items as baby shower gifts or first-birthday gifts. Every penny you spend on your precious one will be worth it in the end, but up front the cost can be overwhelming! Prioritize what items you need for your baby and put others on a wish list. Make sure you register for the things that you want and need most. After your baby showers, you can purchase additional things you still need. Most stores will even give you an additional discount on items left on your registry so be sure to ask for extra savings. Cut down on other purchases by researching online, shopping around and borrowing gear from family and friends. Be the first to comment on "How Much Should Baby Expenses Really Cost?"